Time for a new croquet set? In this buyer’s guide, we’ve reviewed the top 9 best croquet sets on the market right now. We’ve also outlined some key things to consider when buying, so that you can choose the right equipment for you and your family. In this part, we’ll look at 9 of the best croquet sets on the market in terms of value for money. 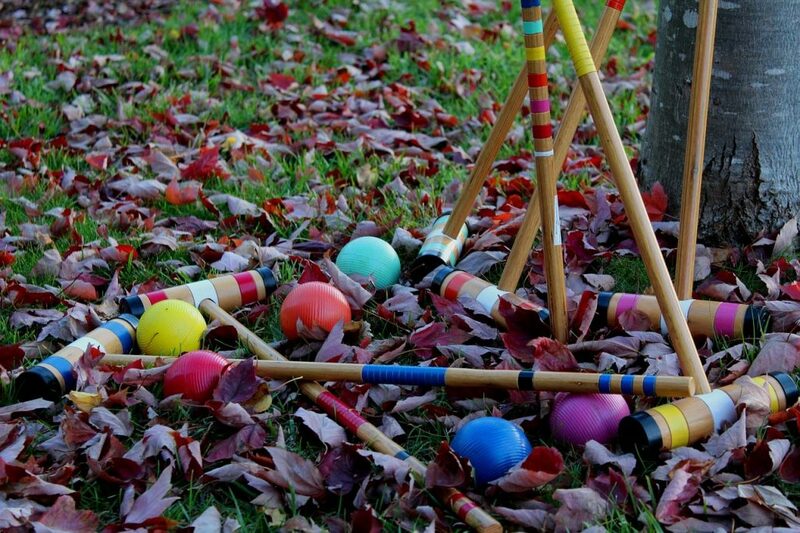 After years of fun in the backyard, most croquet sets can begin to look a little worse for wear. It isn’t uncommon to notice mallets fading, stakes chipping, or wickets rusting after you’ve had your croquet set for a long time. However, Harvil’s equipment won’t have any such issues. The 30″ hardwood mallets come with super-tough bamboo heads to prevent chipping, and the balls are made of a resilient polymer compound. In addition, the wickets are vinyl-coated to protect against humidity, ensuring they’ll remain rust-free for years to come. Harvil is so confident of the durability of their set that they offer a limited warranty against damage. You also get a sturdy nylon carry case, which makes it easy to take the set with you to the park or on camping trips. However, you’ll have to take the mallet heads off to fit them in the bag. This is a fairly easy process though – you can unscrew them by hand pretty quickly. The only real downside to this set is its price. It’s slightly more expensive than most other options out there. Considering how well-made it is though, we think it’s worth the extra cost. Comes with a sturdy carry case. Slightly expensive, but you get what you pay for. Not a fan of painted mallets? The GoSports croquet set comes with unpainted hardwood mallets, making for a more traditional look and feel. They’re also a bit longer than the ones Harvil includes with their set, coming in at 36″ long (as opposed to 30″). This makes them a little bit easier to use for taller people. Plus, these mallets have a padded leather grip at the top, so they’re super comfortable to shoot with and hold in between turns. However, the great thing about this set is its price. For such nice equipment, the cost is very reasonable. GoSports even includes a rulebook with this set, as well as a warranty against defects. Their customer service is second to none – if you have any issues with the durability of this equipment, just ask nicely and GoSports should replace it for you. Another benefit of this option is the carry case. It’s very tough, so you can leave your croquet gear in it during the winter to keep it protected. But the best thing about the included bag is how big it is – you won’t need to disassemble your mallets to get them inside the case. Comes with a large carry case and a rulebook. Mallets are nice and long. N/A – great set for the money. This set probably has the best-quality mallets of any set out there. They’re each 30” long, and have a nice, weighty feel to them. As a result, they feel incredible to use and make a great sound when striking the ball, but would probably be a bit heavy for really young kids. Another benefit of having such well-made mallets is the durability they offer. No longer do you have to worry about chipping – the hard wood used is incredibly strong, and will hold up really well over time. Even the stakes are made of this same type of wood, and the powder-coated wickets simply won’t rust. North Meadow even offer a 1-year manufacturer’s warranty, which is a really nice thing to have. As you’d expect considering what you’re paying, the Scottsdale set comes with a great-quality cotton carry bag. But the best part is, it’s large enough to fit all 6 mallets without the need to detach the heads. Meaning, you won’t have to spend time removing and then reattaching them every time you take the set to the park. You will pay a premium for this set. However, if you’re fed up of super-lightweight mallets, or are sick of equipment that breaks easily, we think that the Scottsdale is definitely worth the money. Fantastic mallets – great quality. Bag fits everything without the need to detach the heads. For the most dedicated croquet players out there, you might be looking for a little something more. This set comes with a heap of useful stuff that the other options we’ve looked at so far just don’t have. For starters, you get eight hand-crafted maple mallets, and you can choose how long you want them – 28″ or 32″. Each mallet head has a brass ring wrapped around it to prevent splitting. As a result, they’re incredibly durable. Secondly, you get a full-size wooden holder. This stand will display your entire set in a nice little area (perhaps in your garage) for easy access. However, there’s no carry bag. This set is meant for people who love to play in their backyard, rather than at the park. You could put the set in your car if you wanted, but it might be a bit annoying to move around. As you’d expect for a set of this quality, the wickets are vinyl coated, meaning they won’t rust easily. The balls are made of plastic polymer, so they don’t chip or fade in the sun. You also get instructions detailing how to set up a proper croquet course. This is a very expensive set. But if croquet’s your passion, there aren’t many better options on the market right now in terms of overall quality. You definitely get what you pay for, but for casual players, going for something with a travel case might be a better option. Incredibly well-made – mallets, balls and wickets are very durable. Comes with a stand to display the set. Caters for up to eight players. Looks awesome – colors are very bright. This is one of the cheapest croquet sets on the market right now. If you don’t play the sport that often or you’re on a tight budget, this could be just what you need. Despite being inexpensive, you still get a carry bag to transport this set. It’s also surprisingly durable: the hardwood mallets each have a cap to prevent splitting, the wickets are vinyl coated to protect against rusting, and the stakes are very sturdy indeed. This set is also really simple to set up – the mallets screw in quickly so it’s easy to begin playing as soon as you receive the package. So what’s the downside to paying so little? The mallets are pretty short (26″), and are also fairly light. This is great for kids, but if you’re really tall (above 6’2″ or so), you might have to stoop down a fair bit to hit the ball. Also, the bag isn’t big enough to carry the entire set when the mallets are assembled, and there’s no warranty provided. However, Maggift has a “100% satisfaction” guarantee, meaning you should be able to return your set if there are any issues when you first receive it. Ultimately, this set is definitely worth trying if you’re just starting out with croquet. However, if you begin to take the game more seriously, you’ll probably want to upgrade to a better set sometime in the future. Mallets are quite short (26″). Another option for serious players is the Uber Games range of croquet sets. The company makes a number of options for competitive nine-wicket croquet players. Although they’re fairly expensive, you can save money by buying just what you need. There are sets with four mallets, and others suitable for up to six players. Some come with a heap of really awesome accessories, like corner flags, a wicket hammer, and a hoop drill. No matter whether you go for a cheaper or a more expensive option, you know you’re getting a quality set. The steel wickets are powder coated for durability, and won’t rust in humid conditions. You also get mallets in lengths ranging from 24″ to 38″ – you can choose whatever length suits you best. The four-mallet sets come with two that measure 34″ and two 38″ ones, which is perfect for most families. Each mallet comes with a brass ring, which does a good job at protecting the head against hard hits. The main downside to this set is the lack of a carry case – it’s designed to be kept in one location. However, you should be able to take it to the park if you’ve got a fairly large duffel bag. Just remember that the mallet heads don’t unscrew, so it’ll need to be fairly big. Comes with a heap of useful accessories, like corner flags. Mallets are available in a range of sizes. Feels great to use – the mallet heads don’t unscrew, making for a more traditional feel. For children under the age of six, the small wickets included with traditional croquet sets can be very frustrating. If you’re looking to introduce your toddler to the sport for the very first time, check out this set. To make things easier for kids, the two included mallets are super lightweight. The balls are also light and easy to hit, allowing your child to develop their coordination and timing at their own pace. Plus, this set can help to teach kids how to recognize different colors and numbers, as the included hoops are labeled one, two, three and four. Once they’ve got the basics down, you can challenge them to more advanced croquet games as they grow older. Considering how great an educational tool this set is, the price is fantastic. What’s more, the finish is non-toxic, and the wood used in manufacturing this product is sourced from sustainable forests. The mallets are also very tough: the hardwood construction is designed to stand up to anything your little one can throw at it. Works as an educational tool – not just a fun activity. Easy for kids to understand. Only suitable for young kids, obviously. For children older than six, playing with wide wickets would probably be a bit boring. However, most of these kids are still better off using short mallets and lighter balls, at least until the age of twelve or so. This is what the Trademark Games set is great for. Each of the six mallets is 26″ long, which is the perfect length for preteen kids. Unless you’re over 6 feet tall, you should also find it fairly easy to use these mallets as an adult. In addition, the balls are made of wood, making them light and easy to hit a good distance. Plus, this set is relatively cheap, and it comes with a handy travel case. You can even choose between bags with the logos of your favorite drink companies – Coca-Cola and Bud Light styles are both on offer. However, there’s a slight issue with this set – its durability. Since the balls are made of wood, they can split easily. Although the wickets hold up really well due to their vinyl coating, we can’t say the same for the mallets. They can break easily if not screwed in really tight, and don’t withstand hard hits very well at all. Light mallets and balls – great for kids. Carry case is available in a heap of different styles. Like North Meadow have done with their Scottsdale set, Ropoda have aimed to prioritize durability in producing this set. However, this product is a much cheaper option. To achieve extra toughness while maintaining a reasonable price-point, the company have included specialized caps on the ends of each mallet. They do a great job of preventing splitting, and offer a nice amount of feedback when the ball is struck. However, you still have to screw the handles into the heads, and you can’t get these mallets in the bag without detaching them. The bag itself is quite well-made though. The wickets won’t rust easily, and the molded balls are surprisingly well-made. On the whole, this is actually quite a tough set, but no explicit warranty is included. While the set itself may be durable, there are some other issues which arise as a result of the low price point. The mallet handles can wear down and become a little rough over time, and the stakes do feel a little lightweight. Comes with a nice carry bag. Now we’ll detail some key things to consider when choosing a croquet set. What does a croquet set contain? 9 wickets, allowing you to play either 6-wicket or 9-wicket croquet. This allows up to six players to play. Some sets will come with eight mallets and eight balls, which obviously allows for up to eight players to compete. To help you remember this, the stake or stakes that come with the croquet set should have the colors marked in descending order. In a 2v2 game, the sides are blue and black versus red and yellow. In a 2v2v2 game, the sides are blue and yellow versus red and green versus black and orange. In a 3v3 game, the sides are blue, black and green versus red, yellow and orange. Flip a coin or try and hit the ball as close to the center peg as possible to decide who goes first. When you buy an eight-player set, two more colored balls will be added – typically they’re purple and grey. Traditionally, croquet balls were made of solid wood. 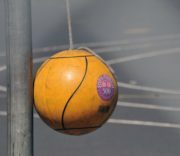 Although they felt great to hit, wooden balls were prone to splitting, and the paint would chip really easily, leaving them looking pretty worse for wear after having being used for a while. Most of the croquet sets on the market at the moment come with plastic polymer croquet balls. They’re far more durable, cheaper, and retain their shape better than wooden balls. Professional croquet tournaments even use plastic balls these days, so you don’t need to worry about how they’ll perform. 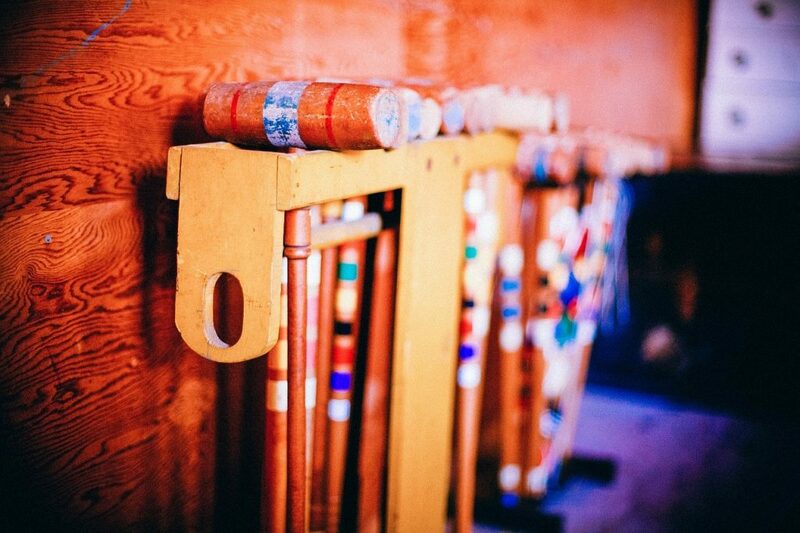 The mallets are probably the most important part of any croquet set. They’re what you’ll be holding for hours on end when playing, and they’ll have to withstand some pretty solid hits in-game. How durable are they? Are the joints well-made, and is the wood high-quality? Do they come with a soft grip for comfortable hitting? Are they long enough? If you’ve got tall people in the family, look for mallets that are at least 30″ long. What do they weigh? Kids might struggle with really heavy mallets, but weighty options tend to be tougher. What are they made of? Normally, manufacturers use hardwood like maple or ash. There are also some fiberglass and aluminum options out there these days too, but they don’t have the same feel to them as a proper wooden mallet. What else should I look for when buying? Durable mallets, as we discussed above. A decent warranty for peace of mind when buying. A bag/case to carry and store the set. A stand (optional) to hold and display the set. These are great if you want to keep your gear in your garage or shed. The wickets should be 12″ high and 3 11/16″ – 4″ wide. The balls should have a diameter of 3 5/8″ and weigh between 15 3/4oz to 16 1/4oz. The stake(s) should be 1 1/2″ in diameter and 18″ tall. If you’re just playing croquet for fun, having equipment that meets these regulations isn’t such a big deal. But for serious players, it’s important to practice with balls and wickets that are the same size as the ones used in competitive tournaments. Are cheap croquet sets worth it? Most croquet sets cost around $50-$60. For this price, you typically get a decent quality set that’ll last for a long time. However, there’s also a few much cheaper options out there. But are they worth the money? For the most part, no they’re not. Cheap croquet sets are normally made of low-grade wood, which is prone to splitting. They also don’t tend to come with good-quality carry bags, making it annoying to move the set around. You’d be hard-pressed to find a cheap set with a good warranty, and they often include really light balls, which can make accurate hits difficult. It’s possible to find a relatively inexpensive croquet set that’s worth getting. However, be very careful – make sure to look at tons of reviews before buying. 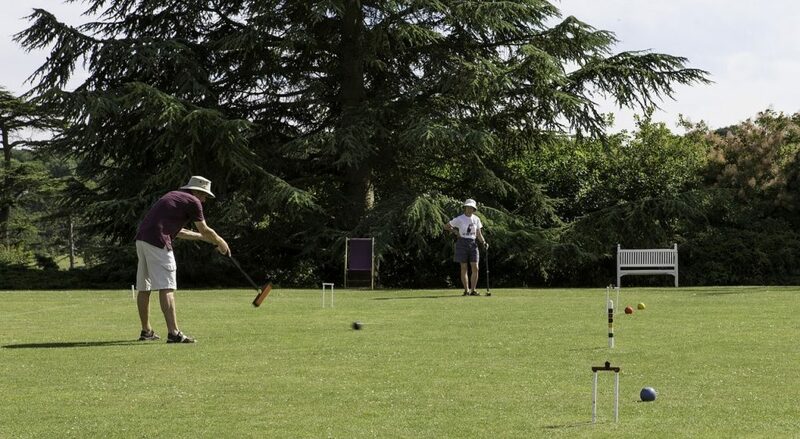 In this guide, we’ve mostly looked at proper croquet sets with full-size mallets, full-weight balls and rectangular wickets. However, if you’ve got young children, there are croquet sets out there designed especially for kids. They typically have really light mallets (sometimes made of foam), bigger wickets (to make it easier to score), and lighter balls. 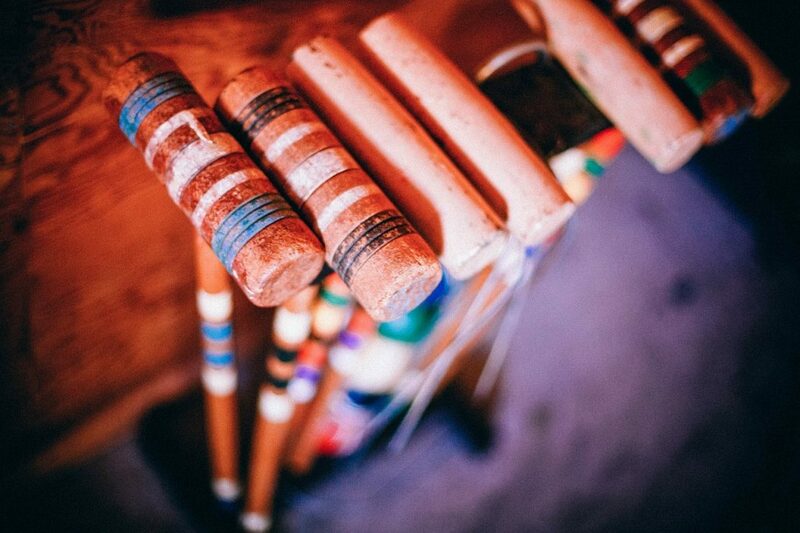 We’d say that most kids above the age of 8 can use a proper adult croquet mallet. However, if you’ve got really young children, it’s worth checking out products like the one below or the Hape set we reviewed in detail. Buying a croquet set isn’t as hard as it looks. Just avoid the cheap crap out there and you’ll be fine! Also, be sure to get something with a warranty if you’re worried about the mallets breaking. Still not sure what to buy? Leave a comment below and we’ll get right back to you!